By Conrad M. Arensberg and Solon T. Kimball, with a new, extended introduction by Anne Byrne, Ricca Edmondson and Tony Varley, National University of Ireland, Galway. 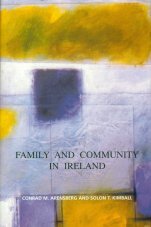 Family and Community in Ireland is a pioneering study, not only in Irish terms but in terms of the development of the social sciences in the modern world. Conceived during the Great Depression in the USA, the Harvard Irish Study (1931-1936) attempted to pioneer an integrated approach to the study of human society that drew on the disciplines of social anthropology, physical anthropology and archaeology. Family and Community in Ireland, based on two years spent observing local life in Clare between 1932 and 1934, is a world-famous social anthropological account of how a traditional rural society functioned in the early decades of the twentieth century. The study quickly became a classic on the strength of the method it used in the study of local communities and because of the richness of its descriptive accounts of local life in town and countryside. With the passage of time, the value of the benchmark account found in Family and Community in Ireland has greatly increased, since the way of life the Americans observed in the Clare of the 1930s has all but disappeared. County Clare was selected as the site for the social anthropological study because, in the words of one of the co-authors of Family and Community in Ireland, it presented a blend of Gaelic and modern British influences with a proportionately large number of small holders, mostly in the west, a clustering of larger farms to the east, and scattered large estates. Its people also lived in medium sized towns, small villages and hamlets, the port town of Kilrush, and resort towns along the coast. There were a few pockets of native Gaelic speakers in the west, while a handful of Church of Ireland adherents and chapel dissenters lived peaceably in a sea of Catholic dominance and toleration. A notable feature of Family and Community in Ireland is that its interpretations of how society operates were ahead of their time and in many ways predate later sociological insights. The Clare study asks questions about human society that have lasting significance and that are of contemporary relevance to us today. This third edition of Family and Community in Ireland is accompanied by an extended introduction that brings to light much new material concerning the political, economic and cultural context in which the study was conducted. This new material allows us to reconstruct the day-to-day experiences of the anthropologists during their time in the Banner County. Both the original book and the introduction to the third edition provide the general reader and the specialised student of social science with an opportunity to reassess the significance of this classic text. The book will be of interest to social scientists, historians, lovers of antiquities, to those interested in Irish-American relations, and to Clare dwellers and their sons and daughters whether at home or living in far-flung corners of the world.